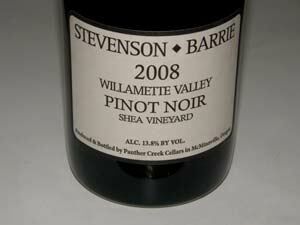 Stevenson-Barrie is winemaker Michael Stevenson's private project with Scott Barrie. Stevenson has been the winemaker at Panther Creek Cellars since 1994, replacing founder Ken Wright. Stevenson-Barrie was established in 1995. The wines are little known outside of Oregon (there is no website) but have a following there. The Panther Creek Cellars Pinot Noirs are full-bodied and robust, while the Stevenson-Barrie Pinot Noirs are more pretty, elegant wines vinified with no new oak. Vineyard sources are Freedom Hill, Shea, Momtazi and Temperance Hill. The wines are sold through select retail channels such as www.avalonwine.com.